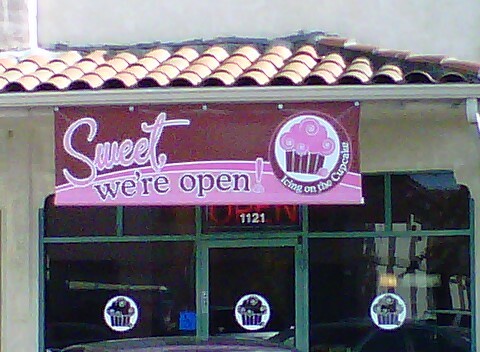 Icing on the Cupcake - 1121 Alhambra Blvd. Not sure I get the cupcake thing, but I’m noticing more and more of them popping up all over Sacramento. The only business that seems to be outgrowing cakes in a cup is self-serve frozen yogurt. I’m all for economic recovery and seeing a “Grand Opening” sign is much more comforting than a “For Lease” sign, but I’m curious as to who is eating all of these cupcakes. It seems like a niche business at best. Speaking of, I did try out Tops Yogurt the other day and was put off by the policy that the employee must fill your free sample cup. Granted, I’ve long wondered when these places would start doing this to control inventory (the obvious scene of the high school crowd coming and filling up on sample after sample comes to mind) but it’s tough when you’re not trying to abuse it. Is it easier to get a commercial loan if you are opening a cupcake or frozen yogurt shop? The Y chromosome suppresses cupcake appreciation. The Y chromosome also enhances bacon appreciation. It’s science, so you know it’s true. We’re big fans of Tops yougurt and I agree with you on the sample thing. Maybe they can make the exception when it’s just adults that want to sample. It’s a trend, but part of the appeal for frozen yogurt is the simplicity of the business model. No menus, no recipes to remember, no heavy-duty cooking prep skills that you have to teach to high school students, not a lot in the way of decor. Prepackaged yogurt for the pumps, a couple dozen toppings that the customers apply, and self-serve serving implements. Most yogurt shops are mostly tile surfaces, you could clean them with a high-pressure hose. Now, some don’t follow the super simple business model, like Mochi, which sets them apart from the rest, but for the most part, it doesn’t seem like there is much to it. Until the fad passes, it’s a license to print money. This just reminds me of the 80s when there was a Penguins Frozen Yogurt on every damn corner. Then those went kerplunk and were replaced with either Jamba Juices or Starbucks, and now it seems to have gone circle and FroYo places are moving back in. I do feel sorry for folks that invest their life savings to open a fad business when the fad is already on the decline. On the otherhand, maybe Sacraggers should put their heads together and identify (or create) the next fad business so we can all be at the front end. My bet is on a potato chip bar, with 50 different flavors you can spray on yourself. Even easier to clean up and staff than a yogurt shop! How about just that — an establishment with 50 different flavors you can spray on yourself? Like self tanning but with flavor. Of course, you could also spray them on other people…and, well, you’re probably going to end up some local blue law about lewd acts in public. “FlavorSpray” does have a nice ring to it. I will be heading to the bank this afternoon. I’m still waiting for Cereal World to come to a college campus near you. Or me.